Emits vibrations & audible sound to protect your yard and garden from pests such as gophers, ground squirrels, moles, snakes, voles, and other burrowing pests. Buy 2, Get the 3rd Free – Just add 3 to your cart! Ultrasonic sound and vibrations protect an area up to 8,500 square feet. The internal battery charges throughout the day to provide continuous coverage 24/7. Your Solar SafeGuard eliminates the need for poisons, traps, and expensive exterminators. Rain and sprinklers are no problem for the Solar SafeGuard's IPX4 waterproof rating. 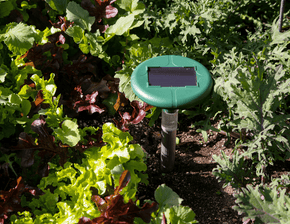 The Solar SafeGuard works by sending ultrasonic sounds and vibrations through the ground up to 8,500 square feet, causing a chaotic environment for the pests and repelling them from your yard and garden. It is environmentally safe and eliminates the need for poisons and traps. The Solar SafeGuard is economical and uses a built-in solar Ni-MH rechargeable battery and can remain charged for up to 7 days for those times when the sun is not out. For best coverage, it’s recommended two units be installed within 100 feet of each other. So when you buy 2 Solar SafeGuards, you will get a 3rd free! 1. Pick a location (make a pilot hole if necessary), and gently insert the aluminum tube into the ground. 2. Snap the power wires together (they only fit one way), and securely fasten the top panel to the aluminum tube. 3. Your Solar SafeGuard is now ready for use! Simply remove and re-install while doing lawn maintenance. The Guardian combines sonic and ultrasonic sounds, predator calls and a thermal motion sensor to detect unwanted pests and drive them out. Use it indoors or outdoors to repel bats, cats, mice, rats, rodents, skunks, raccoons, possums, deer, and other animal pests. Buy 1, Get 1 Half Off – Just add 2 to your cart! Realistic predator owl head bobs and turns using realistic, solar-powered movement to repel pests. The head moves naturally every few minutes, powered by a solar panel on top of the owl's head. Secondary power is also derived from the wind. 18" tall.